A “little teenage girl” from New York City, as she referred to herself—still without a driving learner's permit—is the new face of climbing. On March 22, Ashima Shiraishi repeated Dai Koyamada’s Horizon at Mount Hiei, Japan. 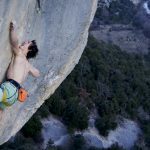 The ascent, which came only weeks before her 15th birthday, fixed her place in climbing history as the first female and the youngest person to send V15. Three months later, she did it again. 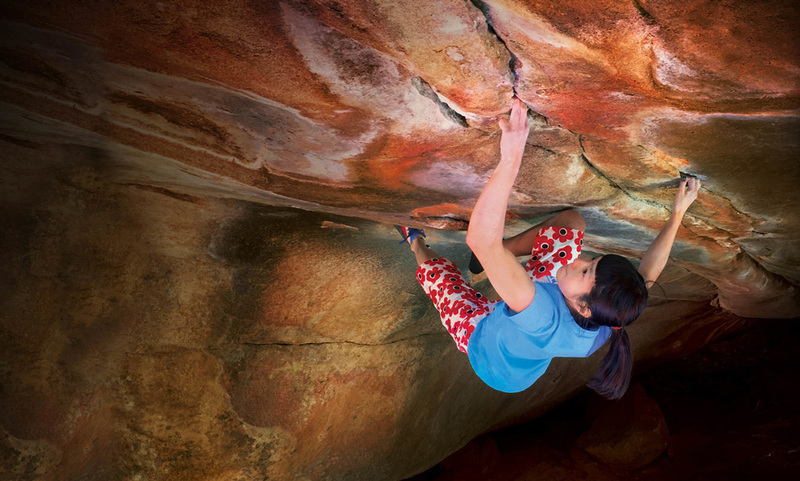 Ashima sent her second V15, Sleepy Rave, in the Hollow Mountain Cave of the Grampians, Australia. 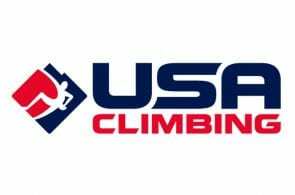 A “little teenage girl” from New York City, as she referred to herself—still without a driving learner’s permit—is the new face of climbing. Ashima, along with 16-year-old Kai Lightner, stars in the film “Young Guns” in this year’s REEL ROCK 11 film tour, about to kick off on September 15 in Boulder, Colorado. 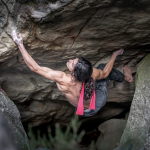 Rock and Ice caught up with Ashima to learn more about Horizon, Sleepy Rave and the film. Yeah, I’m in Australia right now. It’s like a pretty short trip I guess because it’s about three weeks in total. I was in the Grampians before this and right now I’m in the Blue Mountains. How has the trip been so far? Last week I was in the Grampians. I was only bouldering over there, and I got my second V15 [Sleepy Rave], so I’m really excited about that because I just had an accident and I wasn’t really sure how well I could climb, but I surprised myself so that was exciting. Congrats on the climb! How does Sleepy Rave compare to Horizon, your first V15? For me I think Horizon was harder because it was a lot more powerful and like the moves were harder. But then Sleepy Rave is really, really long. They both have their cruxes at the end, but Sleepy Rave has a bunch of resting spots so you can recover from hard moves like in the middle and the beginning and you can rest, and then take it to the top. They are both Dai Koyamada problems, right? Yeah. I climbed with him in Japan and he was the one who actually showed me Horizon and told me to try it. So, um, yeah I definitely respect him a lot for all he’s done for climbing. 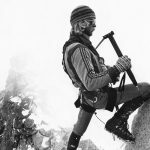 He’s one of my heroes because he’s put up so many first ascents and he’s done like so many hard climbs, it’s really incredible. Did he suggest Sleepy Rave to you as well, or was that something you wanted to try on your own? I was looking forward to climbing in the [Hollow Mountain] cave. The cave is full of linkups, and once I did the linkups into Sleepy Rave, I knew that I could do it. I was just thinking to climb another linkup in the cave because it was raining a lot so we couldn’t really spend time climbing on the other problems that weren’t in caves, so we spent a lot of time in the Hollow Mountain Cave. Editor’s note: Sleepy Rave links Sleepy Hollow (8A+ V12/13), Cave Man (7C V9), and Dead Can’t Dance (8A V11) inside Hollow Mountain Cave. Can you tell us more about Horizon? Does it appear in “Young Guns”? Yeah, it’s in the film and it’s a pretty big part of me climbing in Japan, and I guess like putting up first ascents and some other climbing there. I think [Japan has] the best climbing I’ve ever climbed. It’s so beautiful and there’s so much potential for hard rock climbing there, it’s really amazing. Was that your first time climbing in Japan? I bouldered there a few years ago but it was in the summer so I didn’t really climb too much. How long have you known Kai for? I think I’ve known Kai for about, like, six years. Was Norway the first big trip that you guys have gone on together? Kai, actually, surprisingly, hasn’t really done many outdoor trips. So, I think it was like his second big trip. And yeah that was our first big trip together. We always see each other at competitions and at climbing gyms, but we’ve never gone on a climbing trip outdoors together. So, yeah that was a first. 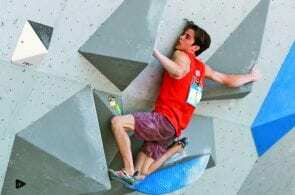 How is Kai as a climbing partner? We’re very different as in, like size and style because he’s a lot taller than me. We’re like opposites because I’m the small one and he’s the really tall one. But he’s a great partner and he’s nice to hang out with, so it was always fun. 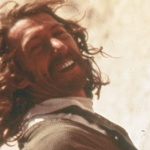 Did you get to see the film as it was put together, or only the final product? They sent me the final product and some little short clips of it here and there, so, yeah, I was like a little bit a part of the team. I watched the footage and said what I thought about it and stuff like that. Are you excited to be in the film? Yeah, yeah. I remember being in a REEL ROCK a few years ago and it was shown at a bunch of different festivals and a lot of people saw it, and um, yeah it’s amazing to have people watch you on like the big screen and like talk about it. It’s almost like being a celebrity, you know? I guess sometimes I get a little bit nervous because I don’t know what people are going to think about it. And, I mean, in every film there’s a part where it’s like a funny piece of you, you know? 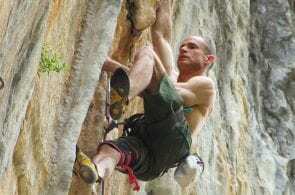 It’s yourself and it’s not just you being a climber. It’s you being, like a little teenage girl. So I guess some parts I’m a little embarrassed about, but it’s always funny to watch. Do you have any of those moments in Young Guns? All right, well, I won’t ask about them because I don’t want to spoil it for anyone! 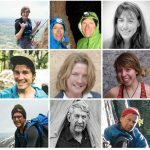 Check out the REEL ROCK 11 film lineup here and visit reelrocktour.com for a complete schedule of screenings and locations.